Over The Baggy: Is Delmon Young on the verge of breaking out? Is Delmon Young on the verge of breaking out? It was less than two weeks ago in this space that I chronicled Delmon Young’s swing, which had become slower, and that his timing was all sorts of messed up. According to observations from FSN analyst Roy Smalley Young was putting too much of his weight on his front foot, leaving him to hit with just his hands. This left him unable to drive the ball in the manner in which he did just a year ago. His power numbers confirmed this as he was slugging .257 as recently as June 5. With the problem identified, it would only be a matter of time before Young would respond and make the necessary adjustments. Because he had been reportedly standoffish about his mechanics, that “matter of time” could have been weeks or months before corrections would be made. Surprisingly, it did not take him long to incorporate a new approach at the plate. After returning home from the latest road trip, Young unveiled a new set-up in his stance. It is minor but - after going 8-for-16 with a double and a home run in the Rangers series - it has become obvious that the small change has quickly yielded some positive results for the left fielder. 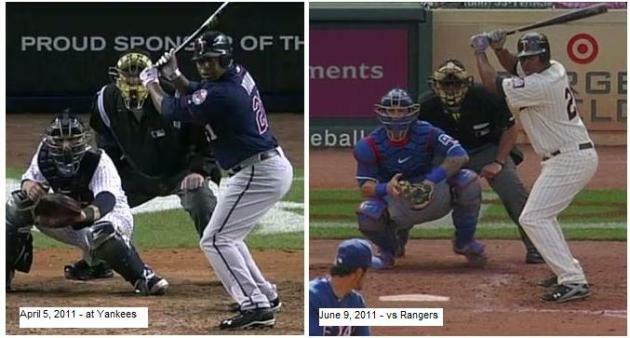 On the left you see Young’s pre-Rangers series hand set-up. Young is holding the bat at a 45-degree angle with his hands at shoulder level. Meanwhile, during the Rangers series, Young made a slight adjustment to his set position, raising his hands almost above his head while holding the bat nearly parallel to the ground. What does raising their hands do for a hitter? So the new hand placement above his helmet provides Young not only with a better timing mechanism, allowing him to get his hands and hips synched more readily, but from that location Young is in a position to leverage his top hand better in his swing. This, in theory, should translate to an increase in power. Getting his hands through the zone quicker also means better plate coverage on the inner-half. One of his biggest flaws at the beginning of the year was his inability to pull pitches. However as of late he has echoed the hard-hittin’ version of himself from 2010, the one who drove the ball into right field with authority. Re-awaking that could mean some immediate offensive contributions for the surging team. Of course, this doesn’t smooth over the holes in the other aspects of his game. Although Young has made the adaptation in his mechanical approach that could set off a potential big streak for him, there are also other factors - such as his plate discipline - that may keep him from taking off. Young’s 2010 vast improvement was aided by a reduction in the frequency of strikeouts. So far this year, Young has reverted back to his pre-2010 tendencies. At 25-years-old with nearly 2,500 plate appearances under his belt, this part of his game is unlikely to go away. It is quite a quandary for the Twins at this juncture. On one hand, you have a young, right-handed power source that, if the past few at bats are any indications of things to come, could be a big factor in lifting the team back into AL Central contention. On the other hand, he has demonstrated lackadaisical play in the field, been vocal about his displeasure for DH-ing (a position he is best suited for) and the Twins have a versatile outfielder in Ben Revere who offers speed and defensive upgrade. Either way, if Young can add a few more extra base hits to the ledger over the next couple of weeks, he could be a very valuable asset to the Twins – be it as a middle-of-the-lineup contributor or as a potential trading chip. Great analysis as always. Hopefully this is the beginning of a hot streak for Delmon, regardless of whether it's simply to increae his trade value or to help lead the offense like he did last year. Will Cuddyer have more trade value with his leadership intangibles than Young? Its hard for me to see the Twins trading Cuddy (one of Gardy's guys) but it has to be an option. Then they could move Young/Revere/Kubel to RF. It might be a moot point if they keep playing like they have. Go Twins!